The MWS-DP-3 Microwave Solids Flow Sensor detects moving solids by utilising highly penetrating microwaves and the Doppler effect. The sensing head transmits microwaves toward the target material. A portion of the microwaves are reflected back to the sensing head and analysed as to whether they are from a moving or stationary object. The highly penetrable microwaves are able to pass through a buildup on the head and even through pipe made of non-conducting materials such as plastics. It is best suited for detecting such materials as powder, granules, etc, moving through a vacuum pipeline. 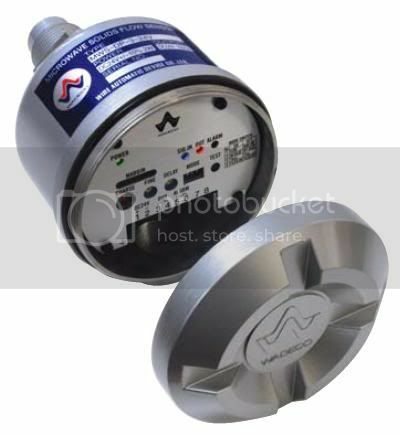 In addition to being used as a solids flow sensor, it can be used as a transmitter in combination with a receiver in order to detect a blocked chute. Equipped With a Filter for Screening Unnecessary Incoming Doppler Signals. This function eliminates unnecessary incoming Doppler signals such as the signals from a vibrating pipe or conveyor and improves the S/N ratio. This enables the sensor to be used in places where previously, non contract flow detection was hardly possible. The received power level and the sensitivity set point are indicated on the sensor allowing for easy visual adjustment and maintenance of the sensor. The indicator clearly displays the advantage of the filter screening effect. The receiver receives microwave beams from the solids flow sensor. When the beam is interrupted, the receiver will output a "blocked chute" signal. The operating distance between the Solids Flow Sensor and Receiver is up to 80 metres (standard type) but may vary from sensor to sensor and according to installation circumstances. 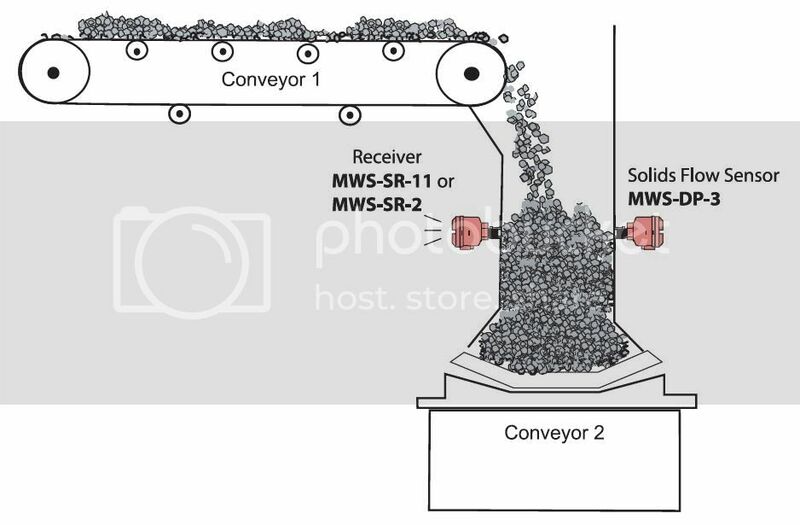 When the MWS-SR-2 receiver is used for this application, its channel function cannot be used. 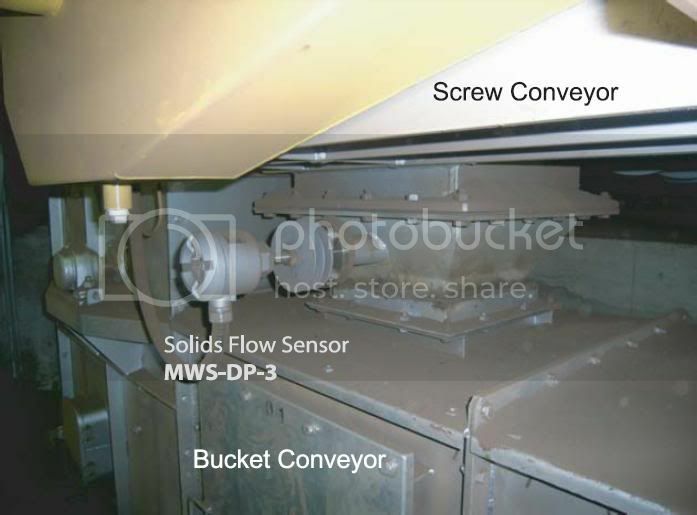 This is an actual application of the Solids Flow Sensor using the filter function. The sensor is installed between 2 conveyors. Distance between the 2 conveyors is 500 millimetres. 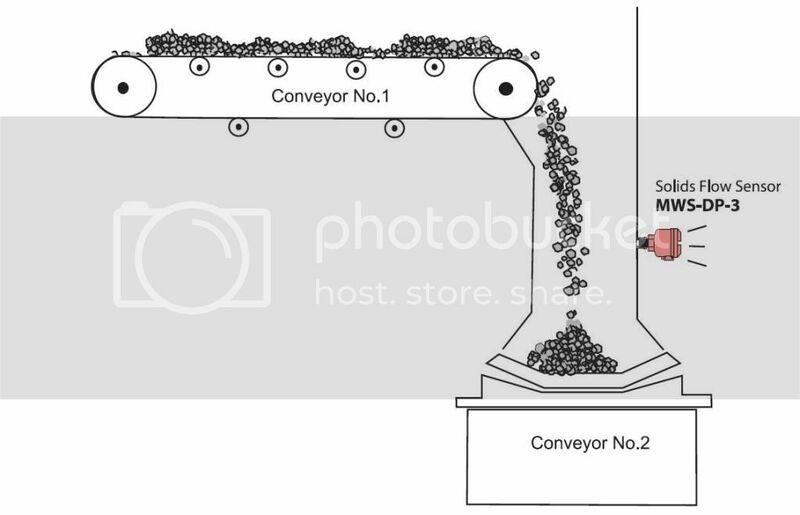 Falling lumps of metal (50mm in size, 700*c) from the screw conveyor are detected without interference from the 2 conveyors' movement. As you can see these sensors are perfect for blocked chute detection applications such as those in mining, food processing, recycling plants etc.